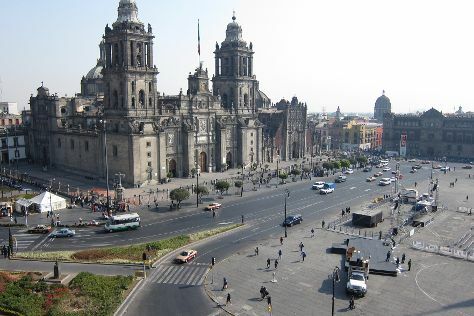 Historic Center (Centro Historico) and Metropolitan Cathedral (Catedral Metropolitana) will appeal to history buffs. Get outdoors at Bosque de Chapultepec and Zoologico Los Coyotes. Venture out of the city with trips to Tepozteco (in Tepoztlan) and Zona Arqueologica Teotihuacan (in San Juan Teotihuacan). There's lots more to do: admire the masterpieces at Palacio de Bellas Artes, step into the grandiose world of Chapultepec Castle, pause for some serene contemplation at Basilica de Santa Maria de Guadalupe, and see the interesting displays at National Museum of Anthropology (Museo Nacional de Antropologia). Plan a Mexico City trip in moments using our itinerary builder. If you are flying in from Colombia, the closest major airports are Licenciado Benito Juarez International Airport, Querétaro Intercontinental Airport and General Francisco J. Mujica International Airport. In November in Mexico City, expect temperatures between 26°C during the day and 11°C at night. Wrap up your sightseeing on the 26th (Mon) early enough to travel back home.